Art opening and poetry night at the Cafe this Friday! The Brixton Pound Cafe will be opening late this Friday for an evening of cultural immersion! Featuring an exclusive pop-up show from Liu Huiting, contemporary artist on the rise, followed by provocation and wit in equal parts with the performance poetry of Laura Taylor and friends. It all kicks off at 6pm – get there by 7 for an artist talk and to guarantee a seat at the poetry slam. A passionate challenge to authority and the ‘politricks’ of power from one of the UK’s most incisive performance poets. This entry was posted in news and tagged art, brixton pound cafe, community, event, local sourcing, locally sourced food on October 19, 2016 by brixtonpound. Over the last two years we’ve been introducing you to our traders – independent business owners who are part of the Brixton Pound family. In this new series we’d like to introduce you to the members of the community who are just as significant: the Brixton Pound users! Last year you’ve met Paul, Alicia, Manda, Pamela, Paul, Vincent, and Francis, and today we’d like to introduce you to Duncan. Duncan is the co-founder of Transition Town Brixton, a community-led initiative to engage everyone in imagining, planning and pioneering the way towards a better future that is less dependent on scarce resources, and more interconnected, cooperative, resilient, humane, local and fun. It has given rise to such ground breaking projects as the Brixton Pound, Community Draught Busters, The Remakery, Brixton Energy/Repowering London, and most recently the Lambeth Local Entrepreneur Forum, the first edition of which is happening on 2nd June. Held at Brixton East 1871 next week, this is an opportunity for small or start-up enterprises to pitch to their local “community of dragons” (everyone!) for support – and not just of money! Everyone can be an investor: of money but also time, resources, skills, enthusiasm, moral support or Facebook likes… With this project, Transition Town Brixton aims to create a culture of community-supported local economy, where the community can invest in various ways in developing the local economy. The audience will include entrepreneurs, potential investors, activists, decision-makers, and community members, and such speakers as the founder of the global Transition Town movement Rob Hopkins, and Lambeth’s Entrepreneur-in-residence, Colin Crooks of Tree Shepherd. The tickets include a seasonal, locally-sourced buffet supper. A one-off special elderflower brew from Brixton Brewery will also be served! And there’s a big discount if you pay in B£s – just text ‘pay ttbrixton 12.99’ to 07797880200. We’ll be there – it would be great to see many of you too! 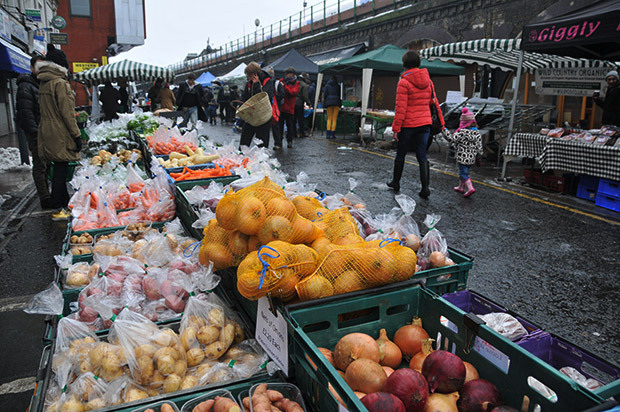 This entry was posted in news and tagged altcurrency, brixton, brixton pound, climate change, local economy, local sourcing, locally sourced food, meet the user, social enterprise, transition town brixton on May 28, 2015 by brixtonpound. We’re never going to tell you to diet (all bodies are beautiful). But there are a few things we at B£ would like to do, or do more of, in 2015, and we thought we’d share our thoughts with you. You all did a stellar job at shopping locally at BriXmas – thank you! Supporting independent businesses and a resilient local economy is a year-round kind of thing though, so it would be great if more of us did more of it. Using B£s is a great way to show your love for a unique, diverse, independent Brixton – and there aren’t many things you *can’t* buy (Aromatherapy, Belly dancing, Comedy club… and many many more all the way till Z). Next time you need something: everyday things (groceries, dry cleaning, DIY supplies), special occasion things (wellness treatments, jewellery, flowers) – check out the B£ Directory and see if you can get it in your local independent business and pay in B£s. Many B£ users have told us before that using B£ actually *saved* them money – it’s so easy to manage your expenses. Set up a standing order for a sum of your choice – B£20, 30, maybe 50 a month, and try to do your all your shopping with it. It helps to buy what you need and when you need it. Going to big chain stores and supermarkets usually ends with buying lots of things you didn’t want or need in the first place. And what you do spend benefits the community! You can explore the B£ Directory – visit businesses you didn’t know were right there, on your doorstep. But Brixton is so much bigger than that, and its rich history and communities can sometimes go unnoticed. Check out Unseen Tours, a multi-award winning social enterprise which offers unique walking tours of London led by homeless, formerly homeless, and vulnerably housed tour guides. Community leader Mahamed, their Brixton guide, will show you many things about your local area that you didn’t know about before. The B£ team went on a tour with him just before Christmas and we learned a lot! He’s an amazing guy, and literally everyone said hello to him in the street. To book a Brixton tour, email walk@sockmobevents.org.uk or call 07514 266 774. Unseen also do tours of Brick Lane, Camden, Covent Garden, London Bridge, and Shoreditch – tell your friends! Did you know you can give B£s to Brixton charities? Brixton Pound supports a number of local charities and community groups who take donations via pay-by-text, so you can use your B£e balance to make a quick and easy donation to a cause you support. The charities can then use their B£s locally; for instance Norwood and Brixton Foodbank regularly buys huge amounts of food with B£s from grocery shops like Faiz Foods. Another great community charity is the Brixton Soup Kitchen, a grassroots project helping homeless people by providing food, support and companionship, and aiming to empower Londoners in need in a warm and friendly environment. Aside from hot meals they offer CV workshops, job guidance, and advice on housing and benefits. For a full list of supported organisations click here, or go straight to your pay-by-text account to make a donation. The already very high vegan contingent of the B£ Team is getting a boost from one of us who’s doing Veganuary this year – good luck Tom! Going vegan, or at least reducing your meat and dairy consumption, makes a bigger environmental impact than giving up driving! It reduces carbon emissions and pollution, saves water, energy, and wildlife. It’s also super good for you. Have a go! If you’re very used to eating meat and dairy, try it part-time: limit the days on which you eat those products, and try to introduce more vegan recipes to your cooking. The Veganuary website has lots of resources for beginner vegans. Flying massively contributes to climate change, and instead of flying less, we are flying more and more – according to Wikipedia about 8.3 million people fly daily, which is twice as much as in 1999. When you’re planning your holiday or business travel this year, consider overland options! Tell us what *you* are doing for a more sustainable 2015! This entry was posted in news and tagged B£, B£e, brixton pound, Brixton Soup Kitchen, climate change, divest, homelessness, local economy, local sourcing, locally sourced food, move your money, Norwood and Brixton Foodbank, reducing emissions, save money, shop local, Unseen Tours, veganism, Veganuary on January 27, 2015 by brixtonpound. I’ve pledged to do all my christmas shopping this year in Brixton Pounds, so this Saturday I went off round Brixton to do just that. Not only did I manage it with ease, I also found a whole load of wonderful new shops I didn’t know existed until a few weeks ago. Many thanks to Wild Caper, Gruff and Tackleton’s Winter Menagerie, Bricolage, Brixton Cornercopia, No. 1 Village Bakeries, Remade in Brixton and Bookmongers for providing such great gifts. I also got my wrapping paper at Pound & Plus taking advantage of their 5% B£ discount. You can watch a short film of the whole experience right here – I hope it inspires you to reject the west end, chain stores, supermarkets and big name brands and get down to Brixton to spend your money where it matters. You won’t be disappointed. Extra special thanks to all the shopkeepers and staff for letting us film and being generous with your time, morleys for issuing my pounds, a massive thanks to Fiona Melville (19 Electric films), filmmaker extraordinaire, who filmed, produced and edited the video, Simon Bishop for equipment loan, and lastly to Rosie’s deli and Mckinson costcutter on Acre Lane for providing the appropriate refreshments and allowing us to spend even more Brixton Pounds. This entry was posted in businesses, christmas shopping, stories and tagged bookmongers brixton, bricolage, brixton, brixton pound, christmas, christmas ideas, christmas presents, christmas shopping, climate change, gruff and tackletons winter menagerie, local economy, local sourcing, locally sourced food, london, low carbon, morleys brixton, peak oil, recycling, remade in brixton, rosie lovell, rosies deli brixton, transition town movement on December 20, 2009 by brixtonpound.